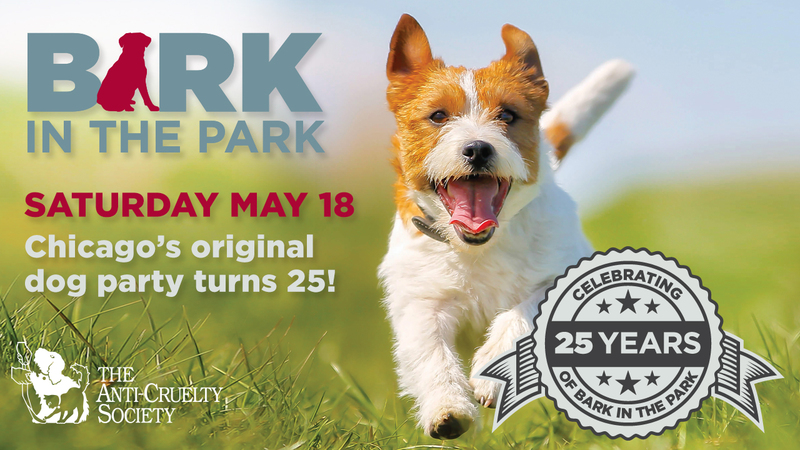 CHICAGO -- Dogs are leading their humans to Chicago's Original Dog Party, Bark in the Park, on Saturday, May 18, 2019 on the Stadium Green at Soldier Field. Rain or shine, thousands of animal-lovers and their dogs will spend a fun morning raising funds and awareness for The Anti-Cruelty Society, Chicago's oldest animal welfare organization which turns 120 in 2019! Registration for the 25th annual Bark in the Park opens at 7:30 a.m., the 2.5 mile walk kicks off at 9:00 a.m. featuring skyline views on Chicago's lakefront path. The party continues until 1:00 p.m. with activities including an agility course, professional demonstrations, dog massages, food samples, live music, a beer tent, and other family-friendly activities! Advance registration is $40 for adults, $10 for children ages 3-12, and children under 3 and dogs are free. Participants are encouraged to join a team or walk as an individual and fundraise for the Society. Fundraising pages can be created at the time of registration at anticruelty.org/bark and prizes are awarded to the top fundraisers. Dog owners planning to attend the event with their pets are required to have their dogs up-to-date on their vaccinations and are encouraged to vaccinate them against the canine influenza virus. Dogs must be on a static leash; retractable leashes are not allowed at the event. This year's event is sponsored by presenting sponsor VCA, Hill's Pet Nutrition, Kelley Drye & Warren LLP, Energy BBDO, Dr. Sheldon and Paulette Rubin, Intouch Solutions, Steve, Kristine, Hannah, Max, Stella, and Gracie Shanker, Metropolitan Vet Center, Prudent Pet Insurance, West Loop Vet Care, Blum Animal Hospital, Nutri Source, Pure Vita, MedVet, Tucker Pup's, PetSmart, Munich RE, Ice Miller, Window Works, Covetrus, Chiro One, Henry Schein Animal Health, Pokomy & Marks LLC, Old Town Animal Care Center, Sydnee's Pet Grooming, Urban Pooch, Premier Vet Group, Integrative Pet Care, Side by Side, Starbucks, Lenny & Larry's Protein, RX Bar, Vienna Beef, Sparking ICE, GoGo Squeeze, Canis Bodyworks, Punkass Pastry LLC, Jeff Jenkin's Midnight Circus, ABC 7 Chicago, She 100.3, 101.9 The Mix, and 97.1 The Drive. In 2019, The Anti-Cruelty Society is celebrating 120 years of being Chicago's oldest, largest, private, open-admission, unlimited stay humane society. With a mission of building a community of caring by helping pets and educating people, its comprehensive programs and services help over 50,000 animals and humans every year and include: adoption, charity veterinary clinic, low or no-cost spay/neuter clinic, cruelty investigations and rescue, humane education & community outreach, a free behavior helpline, dog training classes, S.A.F.E. program (short-term accommodations for emergencies), The Bruckner Rehabilitation & Treatment Center, the Virginia Butts Berger Cat Clinic, and the Dog Rehabilitation Center. For more information, visit www.anticruelty.org or call (312) 644-8338.